Weight gain/loss: +3 or so... not sure. Sleep? Ok for now. Still getting used to getting up 2-3 times per night. Best moment this week? My birthday w/ family and friends. 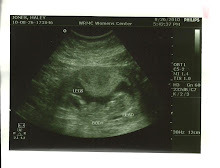 ~Possibly some movement from Baby J. What I miss? Not a thing!!! What I am looking forward to? Dr. appt next monday. What's Baby J up to?? 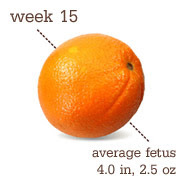 Baby's now the size of a naval orange! Continuing the march toward normal proportions, baby's legs now out-measure his arms. And, finally, all four limbs have functional joints. Your fetus is squirming and wiggling like crazy down in the womb, though you probably can't feel the movements just yet. How far along? 14 weeks TODAY!!!!! Best moment this week? Seeing our sweet baby again on u/s at end of last week. Movement: Just some pulls, stretches, and tugs. 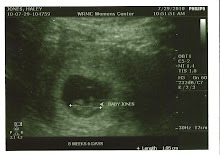 Not sure if i can feel Baby J. yet. Food cravings: Random stuff. Varies from day to day. Still pretty sick at times. What I am looking forward to? Everyday w/ our sweet miracle!! 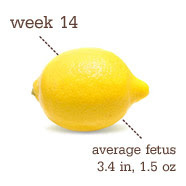 Baby's now the size of a lemon!